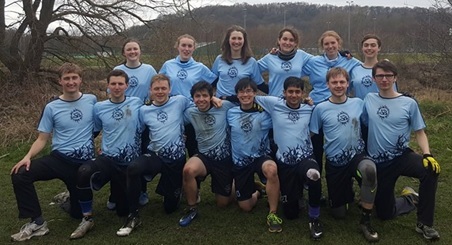 UXON 2016 saw a group of SB players brave the long journey north to compete in a 32-team Swiss Draw format in Durham on the weekend of March 19th/20th. Going in seeded 6th following the phenomenal rise of the team at last year’s event, we won two games and lost four to end the weekend in 13th place. This tournament report: now with extra special crowd-sourced content. The ladies came into this game with two wins vs. Imperial in hand from UWOR (good thing we travelled all the way to Durham to play a team from our region). A strong showing from SB on defence did a solid job of shutting down the Imperial offense (ho-stack, eh), whilst the offence flowed pretty smoothly with some solid first cuts and good continuations. The long throws were on for us. It was good. Tasha played some tasty upfield defence – during a really long point her lady gets the disc only once, at which point Tasha promptly point blocked her. Loving it. We were expecting a tough game here, with Dundee also coming in from a convincing first-round win. They had a couple of real tall guys who played pretty much ever point and dominated the offense. Their women were strong, being able to seriously contribute on offence whilst coming through with some strong bids on defence. Helena had a trifecta of great hucks, going three for three with them all completing. Super fun game to play, although I injured myself after an optimistic over-throw from George so didn’t play the Bristol game. Sad. Danny had a 100% completion rate on IO backhand hucks (one for one). Tejas’ reverse engineering of the Swiss Draw algorithm suggests we over-performed in this game relative to the rest of the weekend. Sweet. Bristol made the strong decision to come to a mixed tournament with a total of four guys. Their women carried their game, with a combination of confident handling and rapid, consistent cuts to the open side that we never quite managed to shut down. I think it was really our defence that let us down here, which was a shame. Meanwhile their guys put in some good deep threats as both throwers and receivers. Danny took down a contested high disc for a score. Perry lost his glasses during a layout bid, and had to scramble to reclaim them from the mud whilst also starting to put on a stall. Saturday evening saw the team head back to Joe’s house in Durham, where much fun was had. We headed to the pub round the corner for dinner where a number of us were defeated by the portion sizes. Ideal. Bryn had a particularly embarrassing period of leg cramps which involving him desperately trying to ‘foam roll’ with an empty ketchup bottle. Back at Joe’s house George spear-headed hydration games, which Rolo followed up with some serious team Sporcle-ing. An early start on Sunday became slightly less early when our game was delayed 30 minutes due to venue issues… sadly we were only informed of this fact having already arrived at the venue and made the trek to the far end of the fields, since we were starting the day towards the bottom of the top-16 bracket. Extra time for some sweet, sweet foam rolling/throwing/stretching/napping. We cottoned on pretty quickly to the two key aspects of the Warwick offence: (1) they like to cut up the line and (2) they weren’t super keen on playing through their women. So we stopped them cutting up the line via a combination of smart man-to-man D from the lads and some open-lane poaches from the women. Consequently many around breaks came out of Warwick, which was sad, though still far more harmful to the flow of their offense than the previous success they’d been having with the up-the-line cuts. It was good in many ways, but we were struggling a lot more in this game with the continuations, which stilted our offense at times. Rolo really thought these guys played weird. Mainly I think they just looked deep a lot, with some especially impressive hucks. One of their ladies got a layout D, which was pretty great. Helena did some strong work cutting upfield. Bryn threw a huck score that was ‘absolutely terrible and only saved by an incredible layout’ (Anegg, 2016). Bryn and Rolo exhibited some great teamwork on a score – a high disc approaches, Rolo calls for it and Bryn immediately ducks out of the way. Jonny take note. Some issues in this game with communication from both teams. We thought Sussex called a time-out, they thought we called a time-out, this became an issue when they later tried to call another time-out mid-point. Another occasion saw a Sussex player stand over a turned disc on our end-zone line and go to pick it up three times before actually doing so, a move which led to both a score and some upset SB players. Overall ended on a mini-high when Joe scored a callahan right on the final buzzer, thanks to some strong forcing from Rolo… on a girl. Great job Rolo. #playmixed. Back and forth game. Portsmouth were a fairly solid team all-round, with a stand-out player of each gender – our main goal was to keep them out of the way as much as possible. After completely failing for the first two points (which happened the be the first time we’d played vs. zone defence all weekend…) we remembered how to play good offense and walked through their zone for a few points, forcing the switch back to man from the Portsmouth defence. Tasha had some top quality handling in this game, with a great sense of when and where to cut for reset swings. Jo accidentally whacked her mark in the face with a forehand fake after an impressive grab, which was a highlight. Some lovely breaks from George. In the end though their offence was more reliable than ours, allowing them to capitalise more effectively on turnovers to take the game away. We headed back from Durham via a service station with only a Burger King, much to George’s dismay. It was great to hear lots of positive things coming from everybody in the debrief huddle. Overall a really fun weekend.